THROUGH ALL THIS HAPPY VALLEY"
…As Miss Allison stepped from the car to the station platform, she looked around in vain for the boys who had promised to meet her. Her arms were so full of bundles, as suburban passengers' usually are, that she could not hold up her long broadcloth skirt, or even turn her handsome fur collar higher over her ears. With a shade of annoyance on her pretty face, she swept across the platform and into the waiting­room, out of the cold. Behind her came a little girl about ten years old, as unlike her as possible, although it was Virginia Dudley's ambition to be exactly like her Aunt Allison. She wanted to be tall, and slender, and grown up; Miss Allison was that, and yet she had kept all her lively girlish ways, and a love of fun that made her charming to everybody, young and old. Virginia longed for wavy brown hair and white hands, and especially for a graceful, easy manner. 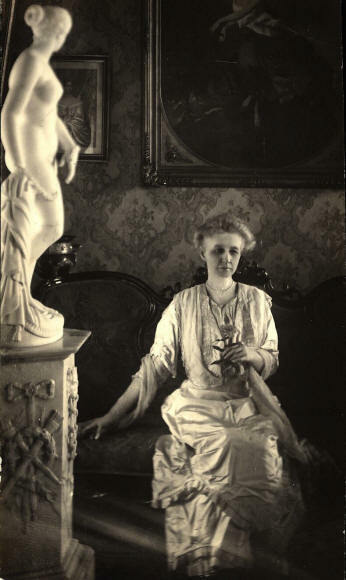 Photos of Fanny Craig show that she looked very much as described in the books – tall, slender and graceful with wavy brown hair and white hands. And always elegantly dressed, thanks to clothes given to her by her wealthy sister, Louise Culbertson -- “Aunt Elise” in the stories. 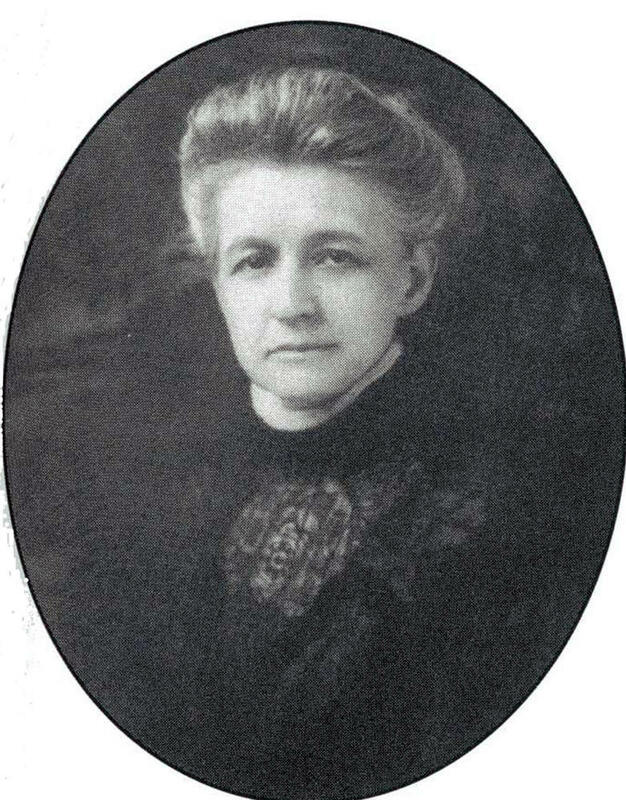 Although Annie Fellows Johnston never provides any clues about the fictional Aunt Allison’s vocation, we know that her real life model was a graduate of the Kentucky College for Young Ladies -- “Lloydsboro Seminary" in the books -- and later taught there herself. 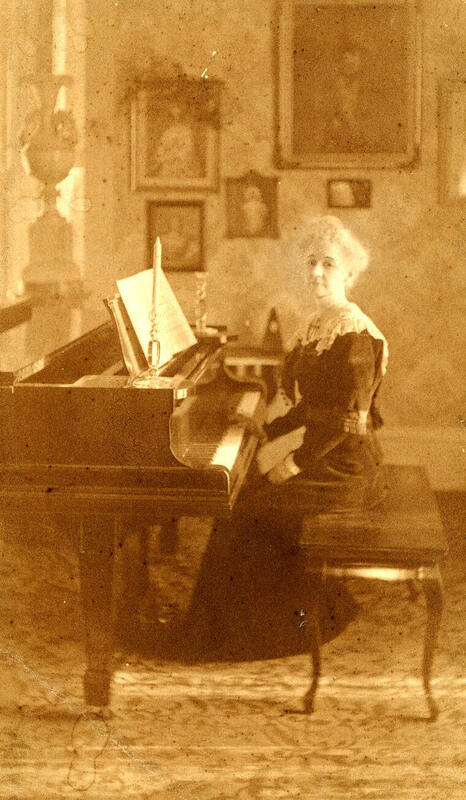 She also taught music -- piano -- in Edgewood's long drawing room. After the Kentucky College for Young Ladies closed, she opened the Villa Ridge School behind her home. She was also a member of the Pewee Valley Presbyterian Church and served as librarian and organist as well as a Sunday school teacher there for many years. "It's Sylvia Gibbs's family," explained Miss Allison, to the girls." Our circle of King's Daughters had them under its wing all winter, or they would have starved. When I discovered what heathen they were, I turned missionary and taught them an hour every Sunday afternoon. They will do anything for me now, and are such clever little mimics that I know they can act the charades charmingly. Besides, they will give us a cakewalk afterward, and sing for us like nightingales." 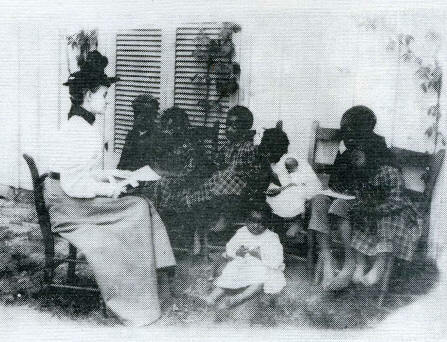 Fanny Craig teaching Pewee Valley’s African American children in a Kate Matthews photograph. From Chapter XII of "The Little Colonel's Christmas Vacation:"
So it happened that a little later, when Miss Allison crossed the road to the post-office, and started up the path toward home, Lloyd was with her, smiling happily over the prospect of spending the day with the patron saint of all the Valley's merrymakings. From Lloyd's earliest recollection, Miss Allison had been the life of every party and picnic in the neighbourhood. She was everybody's confidante. Like Shapur, who gathered something from the heart of every rose to fill his crystal vase, so she had distilled from all these disclosures the precious attar of sympathy, whose sweetness won for her a way, and gained for her a welcome, wherever she went. 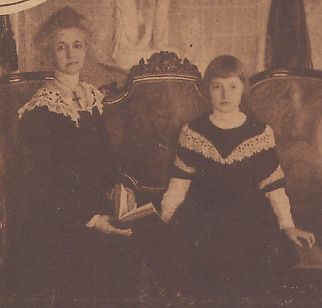 And from Chapter X of "The Little Colonel's Holidays:"
Although Miss Allison was her mother's friend, Lloyd claimed her as her own especial property. But all children did that. Such was the charming interest with which she entered into comradeship with every boy and girl in the Valley, that they counted her one of themselves. A party without Miss Allison was not to be thought of, and a picnic was sure to be a failure unless she was one of the number. The two little knights, Keith and Malcolm, were privileged, by reason of family ties, to call her auntie, but there were many like Lloyd who put her on a pedestal in their affections, and claimed a kinship almost as dear. Fanny Craig lived with her mother, Annie, and two brothers, Aleck and Harry, who was simple-minded. 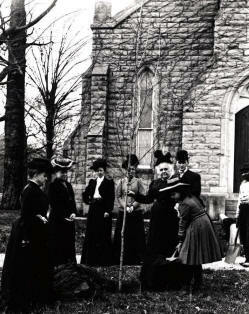 Though she never married and had children of her own, children were constantly present at Edgewood. In addition to her work as a schoolteacher, Fanny helped raise her niece, Alice Craig Peay, after her mother died, and almost certainly helped care for Alice’s children after she married Frank Gatchel and lived a few doors down the street at Woodside. Pewee Valley Historian Gin Chaudoin remembers being invited to Edgewood as a child with her brother and sister to listen to Fanny Craig read aloud. “If she hadn’t seen us for a few days, she would call our mother and ask, ‘Are the children ill?’” she recalls. Fanny often asked the children over after church and served them treats – beaten biscuits and half-dollar sized brandied peaches topped with whipped cream are some that Iva Barbee Morse and Gin Chaudoin remember with relish. And Gin Chaudoin says Miss Craig kept a supply of orange slices in Edgewood’s library to serve her little guests. I, Fanny Craig, being of sound mind, at the suggestion of my sister Louise Culbertson, revoke any will made by me formerly. I here in leave everything of which I am possessed my bonds in my side of the box 1749 in the Fidelity & Columbia Trust Co., my place in Pewee Valley and all the contents of the house and my share in my Mother’s estate to my sister Alice’s grand-children Frances & William Gatchel. I wish them to help support their Uncle Harry as long as he lives and I wish them to give to their Aunts Mary C. Lawton & Louise Culbertson anything in the house that they desire. I name Frank Gatchel & Frances Gatchel (Sampson) Executors of my estate without bond. Miss Fanny Craig, 74 years old, who formerly conducted a private school known as the Villa Ridge School in Pewee Valley, died at 10:35 o’clock Tuesday night at her home in Pewee Valley. A life-long friend of Mrs. Annie Fellows Johnston, the author, Miss Craig was the character known as Miss Allison in Mrs. Johnston’s Little Colonel series, a series of books for children. Miss Craig was born in Louisville in a house on the site where the Jefferson County Armory now stands. She is survived by two sisters, Mrs. Henry W. Lawton of Annapolis, Maryland and Mrs. S. A. Culbertson.